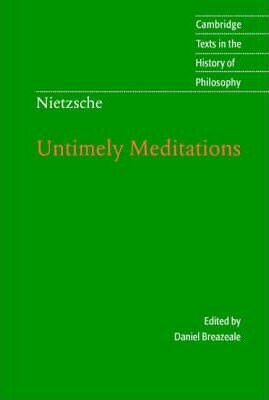 The four short works in Untimely Meditations were published by Nietzsche between 1873 and 1876.They deal with such broad topics as the relationship between popular and genuine culture, strategies for cultural reform, the task of philosophy, the nature of education, and the relationship between art, science and life. They also include Nietzsche's earliest statement of his own understanding of human selfhood as a process of endlessly 'becoming who one is'. As Daniel Breazeale shows in his introduction to this new edition of R. J. Hollingdale's translation of the essays, these four early texts are key documents for understanding the development of Nietzsche's thought and clearly anticipate many of the themes of his later writings. Nietzsche himself always cherished his Untimely Meditations and believed that they provide valuable evidence of his 'becoming and self-overcoming' and constitute a 'public pledge' concerning his own distinctive task as a philosopher. David Strauss, the confessor and the writer; On the uses and disadvantages of history for life; Schopenhauer as educator; Richard Wagner in Bayreuth.